* Is it Global Version or not? YES, includes GOOGLE PLAY, and you can download Facebook, youtube,etc. * Will this Phone Network Frequency works in my country or not? What&apos;s the Languages of Honor 8X ? What&apos;s the Plug of Honor 8X ? 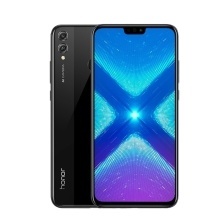 Honor 8X smartphone was launched in September 2018. The phone comes with a 6.50-inch touchscreen display with a resolution of 1080 pixels by 2340 pixels at a PPI of 397 pixels per inch. The Honor 8X is powered by 2.2GHz octa-core processor and it comes with 4GB of RAM. The phone packs 64GB/128GB of internal storage that can be expanded up to 400GB via a TF card. As far as the cameras are concerned, the Honor 8X packs a 20-megapixel (f/1.8) primary camera and a 2-megapixel secondary camera on the rear and a 16-megapixel front shooter for selfies.The Honor 8X is powered by a 3750mAh. It measures 160.40 x 76.60 x 7.80 (height x width x thickness) and weighs 175.00 grams.The Honor 8X is a Dual-SIM (GSM and GSM) smartphone that accepts Nano-SIM and Nano-SIM. Connectivity options include Wi-Fi, GPS, Bluetooth, USB OTG, Micro-USB, 3G and 4G. Sensors on the phone include Fingerprint sensor, Compass/ Magnetometer, Proximity sensor, Accelerometer, Ambient light sensor and Gyroscope. * Support Face ID Access Unlock. * 4GB RAM +64GB ROM; 4GB RAM+128GB ROM Optional. * Big screen 6.50 inch, Resolution: 2340*1080FHD. * Core: HiSilicon Kirin 710 2.2GHz octa-core. * Camera: Front 16.0MP+ Dual Rear(20.0MP+2.0MP). * Classic Glass + Metal Design, Fashionable and Colorful. * Big Battery: 3750mAh, Long Lasting. * TDD: Band 38(2600), 39(1900), 40(2300), 41(2500). Seamless HD fullview screen,with advanced chip-on-film (COF) technology and special antenna design. Only 4.25 mm width of bottom border, and incredible screen-to-body ratio of 91% .The display occupies nearly the entire front of the phone. With a 12nm Cortex-A73 generation-based SoC and a Mali G51 GPU. GPU Turbo: High Performance Graphics Processing Efficiency. GPU Turbo boosts efficiency in graphics processing with full FPS and FPS stability for gaming, while still reducing power consumption. AI dual-camera captures pictures at resolutions up to 20MP. AI multi-scene recognition can identify 22 different categories of objects in images and 500 scenarios in real-time. AI beauty effect can adjust and retouch images based on area segmentation. Enjoy the Super Night Shot. Eliminates handshake issues with long exposure photos and supports machine learning based multi-frame stabilization. Along with multi-frame exposure to prevent over-exposure of backgrounds, the main objects in photos can be optimized, or enhanced with bokeh effects.The AI algorithms offer four different studio-level portraits. Super Slow-motion, Capturing Instantaneous Motions. Short videos can be filmed at 16x slow-motion mode (480fps).Automatic and manual modes are available. Facial recognition allows for faster face unlock in different lighting condition.Support to pay with third part APPs and some exciting APPs working with NFC.